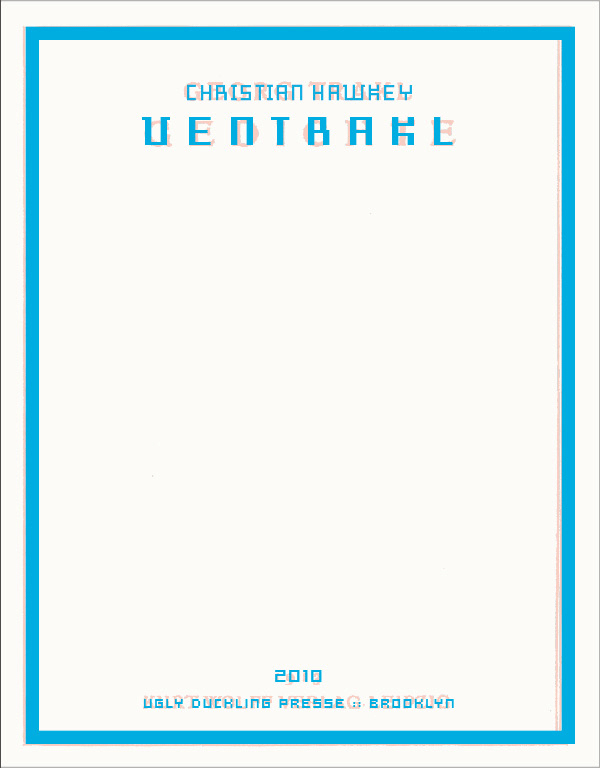 New from Ugly Duckling Presse, Christian Hawkey’s Ventrakl is a “work of collaboration” between the author and Georg Trakl, who died in 1914, 55 years before Hawkey was born. The book, then, is collaborative in the sense that Hawkey uses Trakl’s language, presence through language, image, presence through image, legacy, and other ghostly traces to interact with his corpus and his poems to create a new kind of relationship of exploration. What results is a hybrid catalog of poises, pictures, and entrances that entwine the two bodies and the bodies of languages of the two men in powerful and often surprising ways. I read the first half of this book in the bathtub last night, finding myself becoming warm through the head and in the water in such a way that at page 66 I had to stop and go underwater for a while. Hawkey’s presentation of translations of Trakl’s poems contain a weird shift of the gap of time between them. In the preface he speaks to using translations methods such as typing the old poems in German into Word and letting spell check try to figure out what is being said. Other translations are more direct, or borrowed in other ways, such as assembling Trakl’s fascination with different colors into new texts where the color repeats, resulting in space between the text that examines how words shift and hold their presences, how they can be found to contain countless threads, and how they carry the imagined life of an author you will never see in flesh. The language, pulled from almost a century ago, has a weird sheen of modernspeak, retrofitted with the logics and emotions of a young, dead age, turning time into not a force, but a field. It was surprisingly moving, in the bathtub. It felt like a blanket above the water. Later that night I read the second half while on an exercise bike and burned 445 calories in the transition, giving off my own cells to the third position of my inhabiting the space between the space of the two men. In the gym at night alone with the machines and the book it felt like a few rooms laid together. Hawkey’s prose blocks attempting to enter images of Trakl or sections of images of Trakl take on a weird kind of inhabiting procedure, where Trakl’s body and his body feel as if they are being passed back and forth in the room just beside you, leaving traces of each of them where between the turn of page and in the white you can heard the remainder of their entwined voices, smells, motion. Trakl’s short, intense life is by turns immensely depressing (suicidal, possibly in love with his sister, mentally ill) and in other ways a specter of great intense personal grit and application. Slim sections of Q/A discourse between the two authors present Trakl’s as ominous mandate and reminder of the power of the hand of the living as a cursor through the dead; Trakl also appears often also to weave himself into Hawkey’s speaking of him, weird linings of the sentences with comments on themselves. The result is more a catalog of images and glances than a book of poems, a series of shifting lenses that felt supremely refreshing and moving at the same time. I think this is a book we’ve needed for a while: one about ages of communication, manifestation, making, taking, needing, motivation, depression, terror, resonance, resounding, finding, nameless spaces: a mode somewhere between any mode at all, and yet one with immense tenderness and magick language shaking in its grace. Ventrakl is available from UDP now.